If I am going to put my time, my effort and my ideas into building a brand, it should be around my name. While I might be selling around a topic or a niche, at the end of the day I am selling myself, so why not put my best foot forward? Ensure that people not only know what they are buying, but who they are buying from. Leading with your identity has the potential to build trust and earn you a reputation; it can get you to the point where customers are literally asking for you by name. Another very real concern is that things and names change. Social Media Explorer might be the right name at the right time, but if things continue to evolve, it will be far easier for Chris Brogan to pivot. Proving that you are a person of ideas and that you have the ability to execute is far more important than having a catchy brand that people can remember. It also lets you reinvent yourself as the world changes around you. Social Media might not mean anything in the next few years, but your name… that lasts a lifetime. No Way… It Should Definitely Be Your Brand! Then again, can one person really do everything? It is something you already see Chris talking about on his site. To scale a business around one human has its challenges. Sadly, no matter how good someone might be, we are all limited. When you put yourself at the forefront, that is what customers are going to want. Sure you can build a great team, but at the end of the day, when you are the brand people will want you. No matter how good you are, you are going to get to a point where things just cannot scale on your own. You are going to have to depend on others to help you reach your goals and this may not be something that your customers are comfortable with. For many, the goal is to build a business that can live beyond your lifetime. The beauty of building a brand is that it can become a juggernaut, an entity unto itself. It can grow far beyond the scope of one man and allow for you to build an amazing team who all have the potential to represent the brand. This is something that Jason is actually beginning to experiment with by adding a dozen new writers to Social Media Explorer. This ability to scale far beyond yourself has tremendous potential for those looking to create a world-class organization. It also goes a long way toward taking a lot pressure off of an individual once business picks up. Your Best Bet Is To Build Both! The bottom line: there are risks to going at it from either direction, so hedge your bets and build both. It doesn’t matter which one is at the forefront, be sure to take the time to establish your brand and your own identity. In fact, Chris and Jason both excel at this, even though they approach it in different ways. Jason puts a tremendous amount of effort into his personal brand through his speaking gigs and through his personal account on Twitter. Chris has made sure to lend his personal equity to his marketing company New Marketing Labs as well as many other projects that go beyond his own name. We now live in a world where people want the best of both worlds, a world class organization supported superstars within their walls. Jason and Chris have shown that you can have success either way… as long as you work as hard and are as good as those two are. So, how about you? Are you building up your name or are you focused on your brand? Or like me, are you making sure to spend the time to build both? 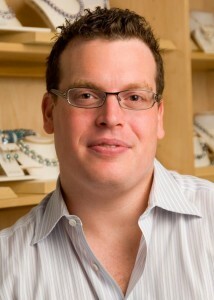 For almost 10 years, Michael Schechter has worked in his family’s business, Honora, a Freshwater Pearl jewelry company based in New York City. Over the past year, Michael has shifted from his role in operations to marketing and currently works as the Director of Community managing Honora‘s Website, Social Media presence as well as the overall customer experience. He also serves on the Executive Board of Gen-Next Jewelers, a community in which the next wave of jewelry manufacturers and retailers can connect and act as a resource for one another. You can connect with him on his personal blog, Twitter or via email at Michael [at] Honora.com.